Dave Scott Blog Was Oil Discovered In Amelia Island’s Waters? Will The City Marina Harbor Mud Wrestling? 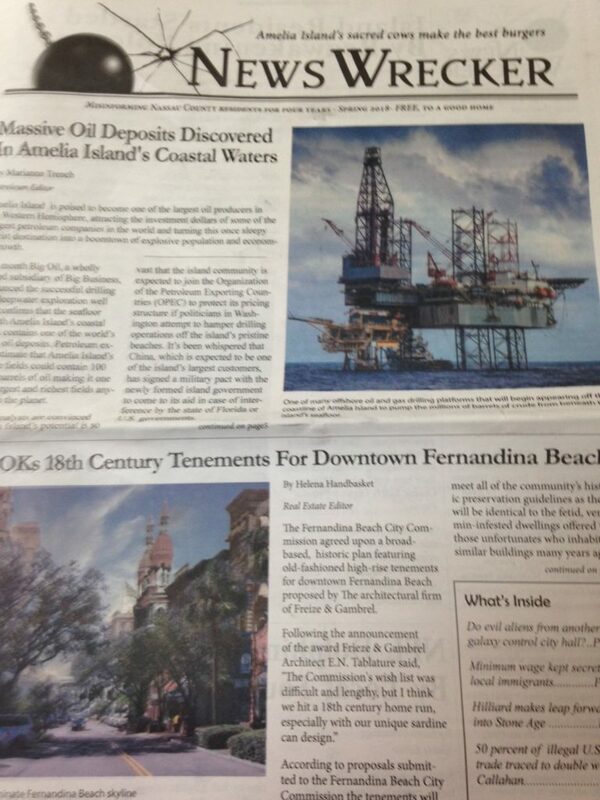 Was Oil Discovered In Amelia Island’s Waters? Will The City Marina Harbor Mud Wrestling? Is Amelia Island soon to become a petroleum boomtown of explosive growth due to massive oil deposits recently discovered in its offshore waters? Is the Fernandina Beach Marina to become a mud wrestling venue? Did a Russian foreign exchange student meddle in a local high school’s student council election? 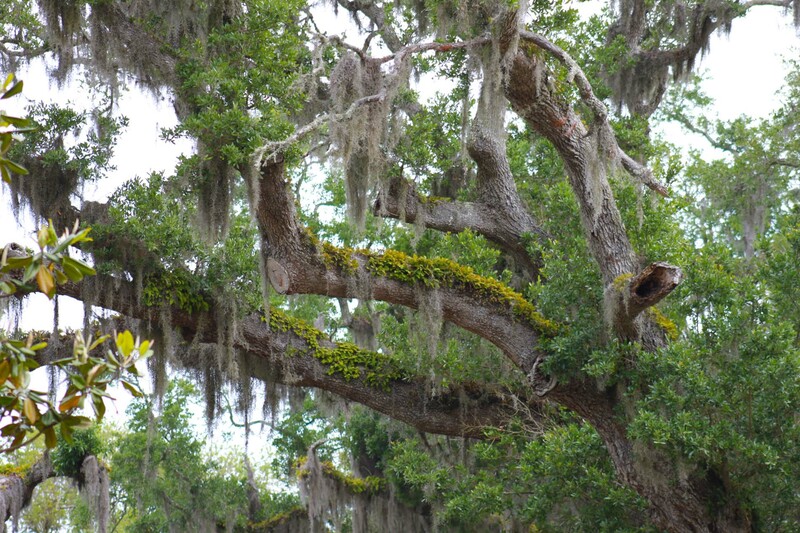 These are just some of the questions answered in the latest edition of the Amelia Island News Wrecker, a satirical tabloid newspaper that is being distributed this week. The free 24-page annual tabloid News Wrecker is available in area pubs, restaurants, businesses, shops and other establishments. An online version of the News Wrecker will be available mid May. This is the fourth year the paper has been published. The tag line for the publication is “Amelia Island’s sacred cows make the best burgers” and its purpose is to generate laughs without resorting to obscenities and vulgarity. However, the one thing the paper can honestly boast of is bad taste. The News Wrecker pokes harmless fun at Nassau County’s small but vocal liberal and far right wing populations, local governing bodies, local news gathering organizations, and other area sacred cows. The last three editions can be read online at ameliaislandnewswrecker.com. Visit Dunwoody, Georgia? The porcine proverb “You can put lipstick on a pig but it is still a pig” came to mind as I flipped through a copy of something that arrived in my mail recently called “America’s Best Vacations”, an advertising vehicle obviously desperate for content. This 20-page publication provides readers with summaries of some of the most boring, mind numbing locales in the South that the editors of this thing consider vacation destinations. Unlike the News Wrecker it isn’t a parody. An article headlined “5 Things to Do in Plano, Texas” listed number 4 as “milk a cow.” I’ve been to Plano — a bedroom community northeast of Dallas — and, yes, milking a cow is probably the most exciting activity a person there could find to do other than feeding chickens. And speaking of “milking”, the writer who managed to produce half a page of copy for a piece headlined “Dunwoody Is the Place to Get to” deserves credit, since finding anything more exciting to do there than taking an afternoon nap took incredible investigative reporting talent. Dunwoody is a very pleasant suburb north of Atlanta that consists of housing developments, a couple of shopping centers and more housing developments. I lived in Atlanta on and off for many years, and believe me, there is nothing, and I mean NOTHING, to see or do in Dunwoody unless you consider grocery shopping and mowing the lawn vacation-worthy experiences. If milking a cow in Plano, Texas and vacationing in Dunwoody, Georgia generate this much excitement for the writer I assume his or her hometown is a cure for insomnia. Things I Wish I’d Said: My mechanic told me: “I couldn’t repair your brakes, so I made your horn louder.” — Stephen Wright. Bring me Your Tired, Your Poor, Your Undocumented Democrats: The following was written by my Tampa Plant High School classmate and friend, Larry Thorneberry. It appeared initially in the American Spectator April 27. In it Larry observes how far left governor of New York Andrew Cuomo is doing an excellent imitation of California Governor Jerry “Moonbeam” Brown to prevent federal authorities from picking up illegal aliens from New York jails and prisons. “In an apparent case of Jerry Brown envy, New York Governor Andrew Cuomo has made it clear he will do what he can to assist anyone on Earth or the closer planets who wishes to crash the American party and live on our hospitality. Of course the people Cuomo is conferring rights on are not American citizens of New York, many of whom don’t fancy picking up the tab for the care and feeding of a significant fraction of the Southern Hemisphere. No, those with the rights are those from elsewhere who’ve fetched up here uninvited. And what exactly he means by “law abiding residents” who are here illegally is anyone’s guess. Cuomo of course denied that his nullification edict has anything to do with New York politics (apparently forgetting for the moment that it’s a sin to tell a lie). No, Cuomo claims that he’s responding to “lawlessness.” Not the lawlessness of citizens of other countries here illegally, but the lawlessness of immigration officials attempting to return these folks to their own countries. Florida School Stats Surging: In April, the U.S. Department of Education released the latest results of the National Assessment of Education Progress (NAEP), which told us how fourth- and eighth-grade students are faring nationally, in every state, and in most big cities in math and reading. Florida made more progress than any other state in the nation in 2017, as the only state that showed improvement in all four NAEP assessments. Source, Georgia Public Policy Foundation. Deregulation Savings: Nearly two dozen “deregulations” by Scott Pruitt, head of the Environmental Protection Agency, have yielded $1 billion in cost savings after just one year. Still to come, the Clean Power Plan and Clean Water Rule are just two of the 44 additional deregulations currently on the agency’s docket. It’s estimated that the elimination of the Clean Power Plan could single-handedly save the economy upwards of $33 billion. The EPA also aims to improve science and transparency in developing regulations Pruitt announced recently. “The era of secret science at EPA is coming to an end,” Pruitt said. “The ability to test, authenticate, and reproduce scientific findings is vital for the integrity of the rule-making process.” Source: Environmental Protection Agency via Georgia Public Policy Foundation. Buyer Beware: The city of Atlanta launched its rooftop Solar Atlanta Program last week, the Atlanta Business Chronicle reported. The pie-in-the-sky goal is to “convert all municipal operations to 100 percent clean energy by 2025.” An article in Forbes notes that between 2009 and 2017, the price of solar panels per watt declined by 75 percent; for wind turbines, it declined by 50 percent. Yet electricity prices increased dramatically in places that deployed significant quantities of renewable energy. “If solar panels and wind turbines became so much cheaper, why did the price of electricity rise instead of decline?” asks author Michael Shellenberger. Governor Appoints Local Gal: Governor Rick Scott announced the appointment of Fernandina Beach’s Laura DiBella to the Florida State College at Jacksonville District Board of Trustees. Ms. DiBella is the port director of the Fernandina Ocean Highway and Port Authority and the executive director of the Nassau County Economic Development Board. She succeeds Jimmie Mayo and is appointed for a term beginning March 22, 2018 and ending May 31, 2019. Drinking, Dining & Dancing at Shrimp Festival: The 2018 Riverfront Stage overlooking the downtown Marina, will feature live music Friday, May 4 through Sunday May 6 with the local Indie group Flipturn kicking things off at 7:30 p.m. Tomorrow, Saturday, May 5, the music begins at 9:30 a.m. with the Fernandina Beach High School Jazz Ensemble and the Honey Badgers at 11 a.m. with Sean McCarthy and his band at 1:00 p.m. At 4:30 that afternoon what festival organizers bill as “The Greatest Hits on Earth” will feature John Elefante, former head singer of Kansas; Randall Hall, formerly of Lynard Skynard; and Jimmy Hall of Wet Willie and formerly with the Jeff Beck Group. On Sunday the day starts with Back From the Brink, a bluegrass group at 11 a.m. followed by local swing band and jazz drummer Les DeMerle and his vocalist wife Bonnie Eisele at noon. The Swinging Medallions round out the day at 3 p.m. Sean McCarthy will also perform at Down Under at 6.p.m. Saturday followed by a performance at PJD’s Beer & Wine Garden’s “I survived Shrimp Festival” party starting at 6 p.m. Monday, May 7. The annual Kentucky Derby takes place tomorrow, Saturday, May 5, with post time at 6:30 p.m. and I will be at the Florida House Mermaid Bar for the 14th year enabling folks who are interested to select a horse at random for a $10 contribution and spend two minutes staring at the TV to cheer their pick around the track. Get there at least an hour ahead of time if you want to pick a horse. Speaking of cheering , PJD’s Beer & Wine Garden celebrated its 1st year anniversary this past Wednesday evening with a jam-packed crowd that enjoyed raffles for hats, T-shirts, and a free buffet. The cozy 12 South 2nd Street Cheers-like pub has earned a reputation as a friendly, fun place for regulars and visitors to hang out and enjoy more than 100 different beers, interesting conversation, and local musicians thanks to efforts put forth by owners Pajamadave Voorhees and his fiance Zan Maddox. Looking forward to the details of the boat trip to nowhere. Dunwoody? Sandy Springs? Roswell? Alpharetta? Nah. All the same. Love my "Island Time." We need more issues of The News Wrecker; how do we support it? As a recent transplant from Amelia Island to Dunwoody Ga. I would never consider this place as a vacation destination unless you just got out of prison and are desperate for somewhere to go. You may ask why in hell did you move from paradise to a suburb of Atlanta. GRAND KIDS plus we have owned this home since 2005.Dunwoody is a nice place to live and convenient to most any place in Atlanta. As a transplant from Metro Atlanta, I chuckled at the Dunwoody reference. It is a nice place to live and raise a family, but certainly not a vacation spot. Can’t believe you really actually referred to Laura DiBella as “Gal” , sounds like a Grandpa from the old West.